Moving is fun, exciting, stressful and exhausting all at the same time. We’ve moved homes five times in the past six years. Now, I realize that isn’t a staggering number but it sure feels like a lot…and we’re perpetual travelers. As full-time travelers most people would think moving would kinda be our M.O. Each move has its own set of challenges and in turn instilled new pearls of transitional wisdom. I wish I could say we have it all down to a science but that would be a downright lie. Each time I feel unprepared, unorganized and completely blown away at how much junk I have. I call it junk because in all honesty, unless it’s something I regularly use, what’s the point in having it. I know this and yet it never fails that I have at least one pair of shoes that never get worn, a dusty cooking gadget shamefully hiding in the back of a cabinet, an article of clothing with the tag still on…and I could go on, but I digress. The point is, moving is always a lot of work no matter how small our house is. This move is a new chapter in our lives and a completely different lifestyle that presents its own set of challenges. We’re going from RV to sailboat and this time we’re taking a slow and steady approach. So, while its all fresh on my brain I wanted to share some of my thoughts about big moves. Moving from RV to RV was a pain in the arse but that was it. No big adjustment period, no major changes, not better, not worse…just a different motorhome. Moving from RV to sailboat requires a lot more assessment of what possessions stay and which ones go. What is sea friendly and what is not. However, this move is nothing compared to when we sold everything and hit the road back in 2010. We had all the emotions of leaving the comfort zone of our home, friends and family, businesses we had built, and a new mobile lifestyle we knew very little about. Top that off with 4,000 sq feet of home furnishings, photography gear, studio props and my ridiculous collection of personal belongings to sell or squeeze into a 200sq ft RV and we were maxed out. It felt massive and at times impossible. We made it through one day at a time and one item at a time. Every move since that first big one has felt leaps and bounds easier. This feels like another really big move but in a completely different way. This one doesn’t seem massive and impossible despite the overwhelming amount we have to learn. The emotions are all very different from that first big leap. We may not know much about sailing but the challenges of life on the move, living small and constant change are all part of our “normal”. The change is much bigger this time and we know we have an adjustment period ahead, but our emotions about it are charged with excitement and curiosity. We’re constantly grinning ear to ear as we’re experiencing our new world from afloat. Singa taking in the new salty sights and sounds. The only times I ever touched any of these things was when we moved or decided to do some spring cleaning. But I just couldn’t bring myself to let them go. As if the memories attached to them would somehow disappear if I did. It was so hard to let go of all those things that I had put such a high emotional price tag on and now that they are all mostly gone…and have been gone for years. It’s hard to believe I ever “needed” to hold onto them. I have learned to keep the high value on the memory and detach it from the physical object. Today, I am almost the opposite and don’t keep any mementos or keepsakes. I don’t feel the need for or want anything extra cluttering my life that doesn’t serve a purpose in it. Now, if I could only learn to apply this logic to shoes…I would be doing really well. The possessions we have and keep now always get a good assessment. What purpose does it serve, how often is it used, is it efficient, do we enjoy the experience of using it? As we transition things from the RV to the boat, we’re asking these questions before we bother finding a home for each thing. There will no doubt be things that once served a purpose in the RV and the RV lifestyle that won’t make it on our sailboat. For example, I’m going to be sad to see my solar oven go but my new home aligns with the wind, not the sun. 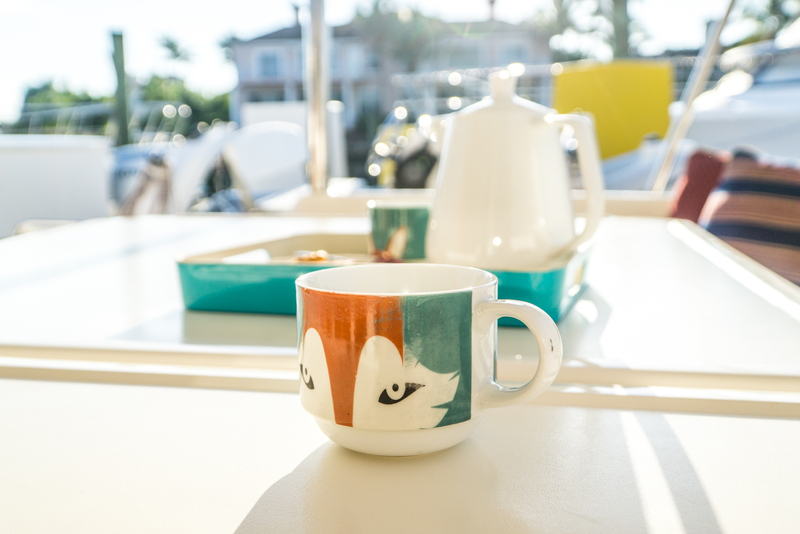 Our first morning coffee on our boat. There are going to be a lot of new firsts in our future. Saying goodbye to our new friend and previous boat owner John. We will keep the RV for a few more weeks as we have a couple of videos we plan to shoot and will migrate our technology (solar, composting toilet, wifi boosters…) onto the boat. Then, the RV will go back to the Fleetwood factory in Indiana. We’re assuming they will let the engineers give it a good assessment to see how everything held up under our strenuous testing and then they’ll sell it at auction or a local dealership. I know many of you are interested so once we know the scoop; we will let you know. We’ll be selling some of the technology like our Lithium Batteries (because our new home already has them) and camp specific stuff like chairs and other gadgets that won’t make sense on the boat. Sadly, we’ll be listing the little Smart car as well. It’s been a good companion over the years but life goes on and we’ll have plenty of memories, photos and videos to remember it by. If you’re interested in our RV Fire Sale stay tuned, once we get the last of the goods out we’ll create a list and share it here and on social media (Facebook, Instagram, Twitter). Kent (our broker) is going to come down and help us sail the boat from Vero to Ft. Lauderdale. Kent has been sailing and working on boats most of his life. So, it should be fun experience and an opportunity to learn a lot about our boat. We’ll anchor (like wild camping for boats) near Ft. Lauderdale, get adjusted to life on the water and wait on a slip to open up for service at Just Catamarans. We are hoping to take care of most of the recommended service items from our survey and sea trial. Some Kent will help us do ourselves and some we’ll have to hire the pros to fix. Then, it’ll be time for our ASA sailing classes at Bluewater Sailing School! After that we should be armed with the knowledge to hire a captain to come on board and sign off on our know how for insurance purposes so we can begin coastal cruising on our own. Enjoying our first sunset at the docks. Anyone else out there about to make a big move? Do you have questions or tips you want to share? Tell us your thoughts in the comments below. We all learn from each other and boy do we have a lot to learn! Things You May Have Noticed In The Video: Pour over coffee maker with coffee pot, collapsible storage bins used for moving. I can’t tell you how much insight (and entertainment) your website and videos have provided for me! We’re shopping for an RV now for traveling North America, and the tips AND opinions are invaluable as a peek into that lifestyle. We did the catamaran thing a couple of years ago; although we previously had other sail boats to race and recreate on the Chesapeake Bay, the cat was our first cruiser. We sailed from Annapolis to Bahamas and beyond. I wish you could have been by my side as I tried over and over again to capture the lighting of the Hopetown Lighthouse from our cockpit!! All your experiences of buying/owning are right on! Hi you two, congrats on moving from land yacht to the catamaran. I did it the opposite. I lived aboard, then taught sailing and even wrote a book on couples sailing “Two on a Boat, How to Keep it Afloat.” You are in for many great adventures. I hope you keep up your videos and visit many places. You will make great sailing friends as you did RVing friends. Are you taking your cat? If so, how are you going to be sure she stays safe? WOW! The travel “bug” has bitten the two of you so extremely me thinks you’ll never land in one place. Isn’t that just so AWESOME! Keep the vids and pics flowing K? My wife and I are just now getting into the RV scene at ages 62 & 57. Better late than never I suppose. Good luck, you guys! So excited for you. Big adjustment, but I’m sure you’ll handle it like a champ. We are bummed that we never connected with you guys on the road, but we have family in Florida that we’ll be visiting occasionally so maybe our paths will still align at some point! May you have steady winds and calm seas! We have been living on and off our boat (not a big cat but 47 ft. monohull). Now we have added a small Airstream Interstate to the mix so we can travel both on land and sea. It makes life a bit more complicated for sure but with elderly parents it is the only way to visit with all of them for now. We enjoy your videos and look forward to experiences of love on the water. I just found this site. I cannot believe that the people I most liked to listen to about RVing are without an RV!!! How on earth did all this happen? All the helpful talk about diesel vs gas, the problems of the industry, etc. All the videos about interesting places to travel (and experience problems to be solved interestingly), etc. All gone with the wind. Or the Wynns…. Ever coming back??? Just found your videos. Great stuff. Looking forward to your boat videos. Do you have any recommendations for roadside assistance or RV clubs. Looking to see if you have any experence for tire change or towing of your RV. I watched the plugging of the tire video. Have done many of those over the years on vehicles..Jason just cracked me up watching him. I felt his pain. Lots of people living on sailboats use solar ovens. You might not want to part with your just yet. Not sure how they do it since the boat aligns with the wind and often swings about while at anchor. You use, or I should say your kitties use World’s Best cat litter! Me too, I have five. 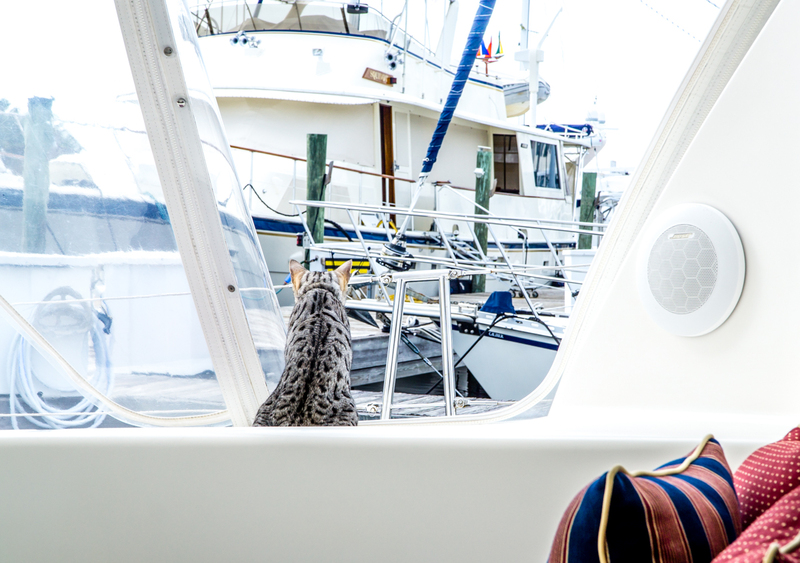 Where did you put the litter box in the motorhomes, and where is it now on the boat? Love your videos!! Interested in the Garmin RV GPS and I will pay shipping to 49665! We will start full-timing in June in a Navion J. Your input has been invaluable. Thanks for the moving video. You did a lot of filming and editing work in addition to the Lot of Work it was to move. How much was the boat? Have fun on the trip, not sure where you’re heading but if I can offer one piece of advice: Do not rush, its impossible to see the entire country in a year…shoot, it’s nearly impossible to see just the state of California in a year! Great video. As I was sitting having lunch overlooking one of our great marina’s here in St. Petersburg, I thought of you two and how your journey has been progressing. Not sure if you’ll be heading down the Atlantic and up into the Gulf of Mexico, but I would be honored to meet you two if you’re in the Tampa Bay area. If you need anything while in Florida, don’t hesitate to contact me. We loved our Vesta and would buy it again. We were on our way to the sailing world when we sold it and Fleetwood suckered us into staying in the RV world a little longer. If you can find a Vesta in good shape, go for it! On Sunday, on my way from the Suwannee River Rendezvous campground where we have our trailer to our home in Lake Mary, FL., we decided to stop at a service station on I-75 and 441 intersection before getting on I-75 south to go home. As we’re pulling out, we saw the Gone with the Wynns Bounder parked in the parking lot with Indian license plates on. My wife asked excitedly to drive around it, as if in a hope of catching a glimpse of you guys (you’re celebrity, you know that, right?). I explained you’ve already moved from the RV to the Cat and the RV was probably heading north to the factory. Nevertheless, it was fun to drive around it. Looking forward to your new adventures. Another question? What are the chances of you two putting one of your staterooms up on Air BnB? Can you talk a bit about your plans for a “snail mail” forwarding service? Do’, don’ts, good vs bad, instrucful stories etc? 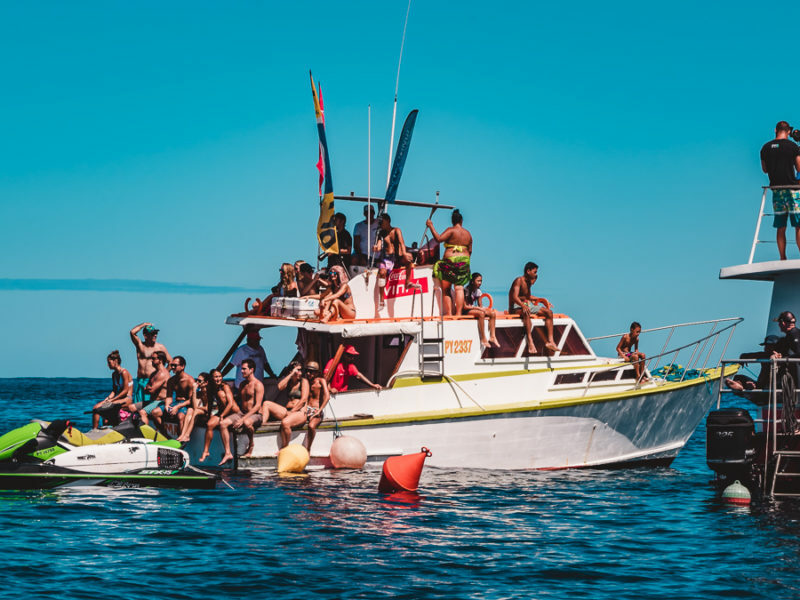 please show a full pic of the outside of the boat, love the blog…. I happened on your blog following a reference from airforums (we’re looking for an AS). I’ve only touched on all your entries, but wanted to thank you for such great videos, photography and your willingness to share the experience. I followed first your sailboat hunt ( I love sailboats), then popped over to Alaska, the last being the ‘getting screwed’ adventure tackling the compressors owner’s manual. I thought that might be a good segway to watching the moving aboard video. It was nice that GH let you bend their rules; welcome to south Florida! I’m anticipating the learning curve videos and hope you both can keep your wonderful sense of humour. 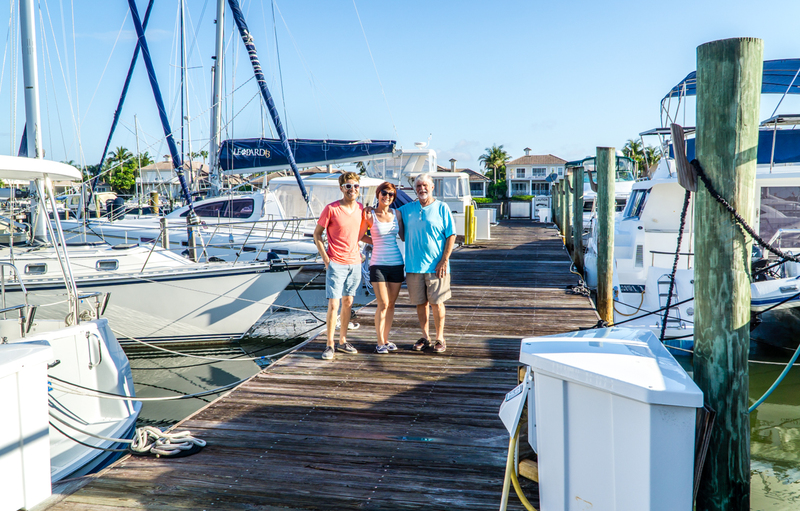 We used to sail the east coast while living in Melbourne Beach and have experienced our share of learning adventures, some while going through Vero on our way to the Bahamas. Be patient, go slow (it won’t stop like a car! ), don’t put your arm/leg out to fend off the dock (plenty of broken limbs; boats heal better), don’t yell (be calm), and have fun! Please contact me if there’s anything we can do for you while you’re close to us (Orlando). Thank you. Thanks for all the great tips Richard. So practical and obviously coming from a place of experience. We very much love sharing the experience with people like yourself and having you along for they journey. So glad you went for this boat! We have been enjoying your travels for quite a while now. It is odd how we feel like we know you. We have been boating in the northwest for many years now and applaud your jump to the boating world. Just want to warn you, which you’ve experienced a taste of (come through with flying colors btw) we’ve always said that boating is 95% pleasure and 5% pure terror. It is addictive though, we have been boating for over 30 years and just upgraded to a 40′ powerboat this year. Tips: museum putty to hold down items as you cruise. Designate the job of seaworthiness prior to departure to 1 person. Portholes, hatches closed, everything put away or lashed down, not a lot of water in heads, it sloshes, fenders/bumpers stored? That’s cool. Been fun watching your journey. Sail&Travel safely . . . And thanks for sharing. What happened to the motorhome and toad? Still waiting for you over at Publix? An observation: I was watching a La Vagabonde video clip the other day and the gal (sorry I don’t know her name) was sitting at the kitchen table eating and her plates and glasses were sliding here and there until finally they ended up on the floor. I wondered why they didn’t simply rubberize the top of the table?? I thought I would throw that your way for thought as I am sure you will experience similar issues soon enough as the sturdy ground you find so familiar gives way to the ebb and flow of King Triton’s every whim. Best of luck. We are going through a similar process as I type this. We picked up our new home (a 33 foot RV) yesterday. Trying to fit our 2000 square foot home into it is quite a trial. The two kids do not want to give up a single stuffed animal! Thank you for sharing, and I’ll add my email address to your list. Wow-another great video! My dad worked for the (then) Atomic Energy Commission, so we moved constantly! I literally would go to sleep in one bed and wake up in another! Moving is expensive, exhausting, and confusing. The good thing is you reorganize and end up reinvigorated when it is over. I used to get cranky as a kid-like I was doing the work!-and my mom always accented the positive. Now? I move every couple of years and have learned to pare down and use what you have-have what you use. The cats ? look like they were born sailors. I guess the only one seasick will be Jason. ? Cannot wait to see more adventures! While I admit I haven’t read through all the comments so this may have been asked and answered. I apologize in advance. As you have indicated. 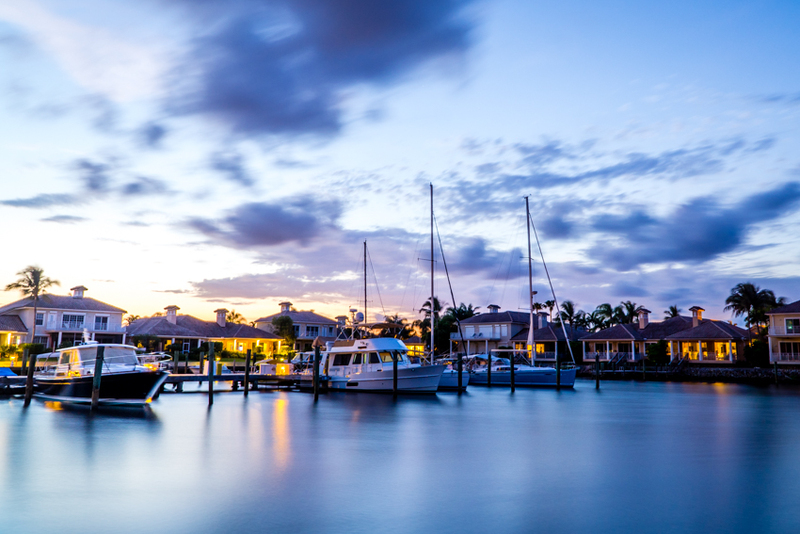 You have to leave Florida and can’t return for six months to avoid the tax implications. Jason mentioned the Chesapeake and maybe a year getting adjusted and your proverbial sea legs. What do you intend to do in the north this first winter? Does the boat have heat? Obviously in the following years you can come back south in winters to more warmer climates. Good luck you two. Enjoy following your adventures. The boat does have heat but we are thinking we will head over to the Bahamas for this fall/winter. It’s a one day sail away, there is a great cruising community (lots of fellow sailors to learn from) and new territory and a culture we haven’t experienced yet. You guys…this is just so incredibly cool! I remember you telling me of your plans to sail when I met you for the first time in Breck in 2013 (which feels like 30 and not 3 years ago). And you doing it!!!! I’m so excited for you! We’ve moved a number of times as well and I too get attached to sentimental thibgs especially when it comes to the boys. Thank God for the digital camera. Our last move from the RV to our house was gut wrenching. I still haven’t accepted it and struggle daily trying to fit in and accept “normal” life. I would hate it if it wasn’t for our big boys… watching them thrive and grow brings me joy. We may be in IN in a few weeks. I don’t know if you are taking the RV up there it but if you are it would be amazing to see you guys one last time before you set sail. Hugs to you both. It does seem like we’ve known you guys for so much longer and it also feels like forever since we last hung out! I can only imagine what it was like going from RV to a home again. What a wild transition for you guys but I know you will all thrive and be back out on the road again before you know it! We won’t be in Indiana but you guys will eventually need a vacation and perhaps a long weekend on board will be just the ticket! Do you have a date for your RV fire sale? I hope you list it on this site first because i don’t have all the other social media sites, especially facebook, I just so dislike it . I still need a lot of stuff for my trailer conversion, I may go with a completely separate power system in the trailer and have the one in my vehicle ( 6 optima yellow tops, go power 3000 pure sine, 300 watt solar) as a secondary system that plugs into the trailer for lights, fridge, water heater and moderate things. I did go with a 6 gallon electric water heater since it seemed good enough for you guys. But i like the idea of having 2 inverters just in case. I recently wired up a switch to override my fans to high for towing in the city but its giving me some weird ECM errors but possibly unrelated. I’m getting there though. We don’t have specifics yet as we are still not 100% on what is going and what is coming with. We will post it here to our site (and an email will go out to subscribers) as soon as we have it all together and go from there. So you guys will be the first to know! the 6 gallon water heater has always been plenty for us…especially with the water saving shower head. I have been reading up on your change to a sailboat. You were leasing your RV. I have not been able to find out any info on leasing an RV. How did you arrange to lease one? Do you have a contact you could share? We look forward to following your adventures in sailing. Many congratulations on being able to make this dream come true! You both look so happy and excited!!! It is really wonderful to see!!!!! When you were starting to clear out your motorhome, I noticed that you had a Cuisinart Oven Central on your kitchen counter. I have just acquired one and love it, although it has seen limited varied use. It makes wonderful hot panini-type sandwiches (or open faced), and I’ve made a wonderfully done cornbread in it. I know you are pressed for time these days, but if you have a moment could you please favor me with your favorite uses for it? Will it be making the transition to Curiosity? It has been a joy to watch your videos. They are well done, and you come across as quite professional. It is a thrill to see you doing well. Kudos! I do plan on eventually creating a video about my fave kitchen gadgets and the central oven is one I use almost daily! I love that thing and since purchasing it, I have not used the convection oven/microwave again. I find it bakes incredibly well. Quick breads, fish, veggies, just about anything. Thanks for watching! Oh, let me tell you…..I sooo do not like these marine heads! They literally stink. I can’t wait to get my composting toilet back. We will make a video about the current marine toilets and swapping over to the composting toilets. 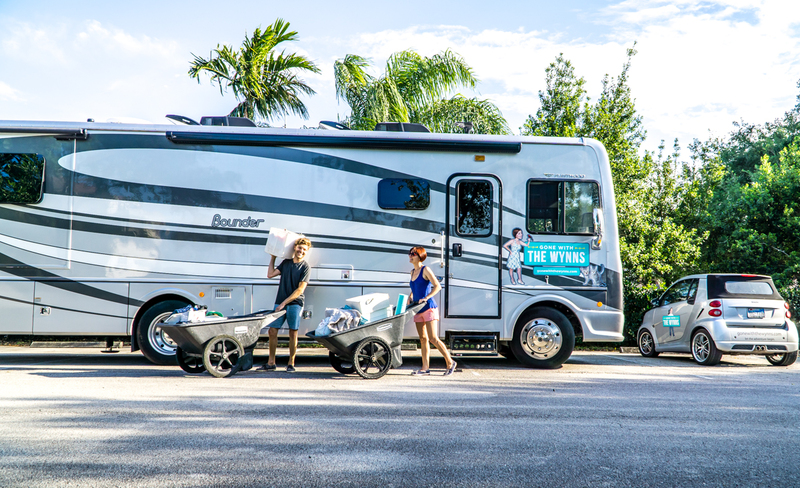 You two have been quite an inspiration to my husband and me on our venturing out into the big wide world of RV full-time living, and we are even more excited to see what your next big challenge & adventure have in store! Happy reorganizing and settling into your shiny new-to-you beauty, and know that we all look forward to the tour…when you have time–and after a much-deserved break–of course ;). Also, feel free to email us about your lithium batteries…we would love those for our rig! Thanks for being ever-inspiring and a joy to follow! Wow, we’re going to miss you guys on land. You’ve educated and inspired us over the last 2 years and we’re in the process of buying our Class A DP now and are on target to become full-timers not too far down the road. We wish you as much fun and luck as we hope we have as we start this new life – but we also feel like we are losing good friends. We’ll still have a look now and then to see how you’re doing. And we’ll still hope to run into you somewhere along the way. Best of luck! Awe, thanks for the love guys but we’re not going anywhere. We’ll still be here so you can still come visit. 🙂 There will be lots of cross over info and things we will learn from the marine side of things that will be RV friendly too. Those are the things that of course most interest us now…the similarities in the worlds and where each can benefit from the other. Should be an interesting learning experience for us over the next several months for sure. How long are you guys planning on sailing? Are you ever going back to RVing full time? We don’t have any set time frames. We plan on sailing around, renting RV’s to explore inland here and there and who knows what else. For us, its all about the travel, experiences and adventures. I stumbled onto one of your recent videos last night. When I recognized the dock at fun in the sun, I had to watch all of your sailing videos. I was out on one of their cats about the time you were there for the second time. My friends and I take Cat Tales to Bimini for a week long dive trip at least once a year. I have a few suggestions for you about a dive compressor etc. If I had to guess, you’re either out on your sailing lessons now, or will be very shortly, probably on Cat Tales. I did that same course many years ago. It was incredibly informative. We did a ton of navigation on paper charts. After a week of 2 and 3 point fixes, DR plots etc it will seem like you’ve got the navigation pretty well in hand, but I strongly suggest you also take the ASA Coastal Navigation course. Then brush up on it periodically, because your GPS will make you get lazy with your chart reading. If you do your lessons on Cat Tales, check out the nice bruise I put in her right next to the starboard bow cleat. I can tell you all about it, and the lessons I learned so maybe you can avoid getting a matching one on your boat. BTW, I’m going again in August. You up for a ‘stream crossing? Very cool that you get to do lessons on your boat!! The charter boats I drive have old and clunky chartplotters as well. I hardly even bother with them. I bought a Sony Xperia Z4 tablet for the last trip, and it worked great with the Navionics charts. Amazing charts for $50 a year. I went with the Z4 tablet because it’s waterproof and the screen is bright enough to read in the daylight. Even though it’s on an app, it’s still a chart and you have to know how to read them, so pay close attention in class to all the symbols etc. The place you’re most likely to get into trouble is at the docks. Most areas in S. Florida will have a pretty good current when the tide changes and generally speaking, current is not your friend when docking, or in my case, leaving the dock. One piece of wisdom I got many years ago is that you always want to approach the dock at the speed you wish to hit it. And remember that the engines are very small and the boat is very big. You will never have enough power to get out of trouble. A light touch on the throttle and patience is the way to go. Just give it time, it will move. If you’re having to go full throttle near the dock, you’re already in trouble. Stop and gather yourself up, then go again. Maybe we can meet up in August if you guys aren’t busy. My girlfriend and I should be there the 20th-ish. If you’re up for the Gulf Stream crossing, we’ll have a compressor for scuba tanks on board. We can go whack some lionfish in Bimini. They’re good eating, but we need more recipes. BTW, if you take your boat to fun in the sun to pick up your instructor, the Las Olas bridge operator is a pinhead. If you can’t raise him on the radio in the first couple of tries, call. He’s probably asleep, and I’m not kidding. The phone number is on the sign on the bridge fenders. Wow you 2 looks awesome!!! Can’t wait to catch up with you in June. Jasper is very excited too. Happy sailing! Excited to see you guys!!! You may be our first guest aboard! We are in Fort Lauderdale, work in the marine industry, and would love to talk with you about your new direction! Hey there , my husband and I have been following y’all since watching you purchase your rv on Tv. We enjoy all the videos and adventures you share. I have one thing that was told to me by a friend that lived on a boat for awhile.. Thanks!!! We’re excited too. When the dust settles, we will try to organize a meetup. Congrats, you guys! That boat looks amazing and you’re going to have a wonderful time. I’ve been so happy to read about and watch your journey toward this and all that you’ve learned. My family is moving in the next week too, actually! We’re going from our house to an apartment for a year, just one step in what for us is a longer transition to a more flexible life. I’m really looking forward to NOT worrying about the problems of home ownership. We’re majorly downsizing to do this, and it feels great. I’m sure I’ll be sad to leave the home we’ve raised our kids in, but right now I’m more excited than not! Where do I find and buy the white plastic folding boxes you used for moving? Thanks! Looks like Nikki & Jason are too busy to respond to all of us so I’ll point you in the right direction. The ‘storage bins used for moving’ is a link. Thanks John!!! You are awesome. I am so excited for the four of you, and thank you so much for taking us all along on your new adventures. Looking forward to seeing all the creative ways you learn how to stow all your belongings. I guess you have so many comments that you have to limit those you actually post. We’ve followed your adventures for the last year and really enjoyed the videos and adventures; unfortunately, I guess we don’t know the formula for sharing comments—does someone have to subscribe to your blog to comment? If you get this comment we wish you good luck in your sailing adventures and will miss your RV posts. Hey Dan, some comments get held under moderation (first time comments and links…) and depending on what is going on in our lives or internet connection availablity it can take us a day or two before we can come back, approve and respond to them. Sorry you thought we were not showing your comment for some reason…totally not the case at all. We love love the comments and well wishes! Thanks for following along and being a part of the journey! This month we are moving out of our sticks and bricks house and settling into our 36′ Nexus Bentley. We are currently parked about 20 minutes away from the house with a gorgeous view of Mt Rainier. We are going through the same challenges – do we need it in the RV, should it be stored at least for a while? given away? stored/given to friends? passed on to the kids? My DH and I have different ideas about the actions to take and how soon. The house should be on the market within 6 weeks and the garage is FULL of ‘stuff’. The RV has a box right in the middle of the floor, it has to be shifted from side to side as activity dictates. We are not as dedicated as you getting everything ‘stowed’ quickly. What is there about typical humans that like to hold on to bites and pieces of things that only occupy space and are rarely used/viewed/appreciated? I hope that the numerous donations we are making will fill a need in someone else’ life. Oh man you guys are in it right now! Hang in there and those first few nights of true freedom are going to feel like a million bucks. I do have to say, I visit friends and family that are still benefiting from our furniture and extras from when we first hit the road. It’s kinda fun to visit your old stuff and see it take on a new life. Good luck! Recently started watching your channel…we’ve been watching sailing vlogs because we’re learning to sail ourselves! We have a 23.5 Hunter that we put into Lake Michigan just today. We’ll be cruising the Chicago waterfront as we learn the ways of the wind. We’re looking forward to learning from you, too! Welcome aboard! We sailed with friends in Chicago and learned quickly that lakes can be just as intense as open ocean! Have fun out there and thanks for saying hello! Signing on for a life at sea means less opportunities to shop for those incidental items. It also means taking only the most impotant essentials. When I moved onto a boat the first thing I bought was a cafetiere for that first coffee brew of the day hit ! No messing about with filters or coffee machines and great coffee takes just three to four minutes to arrive. Good luck paring down all the other non essentials. Not sure if you saw this. I just came across it and thought you would like to hear this couples sailing around the world story when they have never done it before. Very informative, they actually reminded me of the two of you. There are 5 parts to their story (their not long). Pay close attn to the end of part 4 pictures. It’s one of the cutest things I’ve ever seen. I wish you both the best. This video drained me. I’ll stick with my toy hauler RV. Again, an interesting note: S1, E2 viewed again on GAC last night with the Wynns. They must miss you also, leaving the RV travels for catamaran sailing. Although we are planning it, we have not even purchased our RV to fulltime in and now you have me wanting a boat too! I will stick with a motor boat though, too old to winch and yaw???? I totally enjoy your videos and tips. I certainly respect your time and efforts. Kudos to you for following your dreams! We hope to embark on a journey sometime soon, (last child hopefully bound for college in the fall). You’re giving me the oomph I need to purge and get ready to sell our home so that we can move onto adventure. Thanks for everything! Thanks Diane! You nailed it with the time and efforts. With all these sleeping quarters in the new boat…maybe we can lure someone on board to help with editing. 🙂 Sounds like you are on the final count down to travel and adventure…you can do it!!! Great stuff you guys!! fun reading, inspirational, Yes, we are doing what you two did when you first started. Staring out on our vintage trailer, build our modular high-tech nest and studios, but, in most part—be on the road. For us, the big change is that we have become empty nesters (5 kids, 3 grandkids). Our story is just beginning…so, from our point of view, there is always new memories to be harvested, after it’s all been done. PS, can the cats swim? Yes, the cats are great swimmers (most can, just don’t like too). What type of vintage trailer did you go with? We have happened across a few vintage trailer/motorhome rallies over the years and it always makes us want one. There are so many cool oldies out there. I’ve learn’t something today—cats swim! We’ll have 6 cockers going with us in a upcycled 1973 Airstream Land Yacht, we affectionally call modpod 1 with a green Vespa scooter as our dingy (zoom zoom). I love you guys! Love your posts. Thank you for sharing! Live in San Diego, on my last project building out an investment property so I can retire on the cash flow, and place to stow stealth camper and travel full time. Love, love what your doing. 🙂 Inspiring to continue my ASA sailing classes so I can eventually charter various coastal cruising locations. Sounds like your heading south florida and Bahamas? Oh my! Safe travels and may the good Lord bless you and in “Curiosity”. Thanks! San Diego is such a beautiful area and perfect for sailing! We have friends who are live aboard sailors in San Diego on their Magellan 36 and they love it. We are planning on south Florida and Bahamas for Fall/Winter…then who knows! Hello I’m interested in your lithium battery. Awesome! We will list everything soon, so stay tuned! Your adventure has motivated me to enroll in the ASA series of classes so that I can eventually charter smaller sailboats for short cruises. My wife & I are signed up for classes on Lake St. Clair in Michigan starting next month. This has been something I’ve considered for years, and now that we’re empty nesters and close to retirement, it’s now or never. I have experience racing dinghies, but have never sailed anything with a keel and cabin. After reading your last post I said “Hey, I’m moving ahead on this” . Looked on the ASA website to find a school close to me, called them up, and signed up. My wife and I have started studying the theory stuff, and learning to tie all the knots. There are some nifty free knot tying apps out there, plus some nifty little sailboat simulators to help understand optimum sail trim. We are planning to live full time in an RV upon retirement (which is how I started following your adventures in the first place). I find the idea of exploring the US coasts in our RV, and being able to rent sailboats at various places for a couple of days on the water, very appealing. And, our grandkids, who live in San Diego, would probably enjoy going with us some times. My husband and I are just starting the process of getting the house ready for the market and selling things off to buy our RV to live in full-time. We found your site a few months ago and have really enjoyed your videos and all the information that they give. I will be very interested in your next adventure as I have always wanted to live on the ocean and have that life style. Wish you both safe sailings and calm seas. WOW!!!! You’re in!!!! Looks like FREEDOM to me… Can’t wait to see it in person. You’re mom and I were already planning my September birthday there??? We will see how that might work in you’re plans. Enjoy you’re free time.. I’m sure class is about to start!!! Enjoy the process. Nobody but the Wynns could take the time while moving to set up cameras (multiple times) to record the event. Nobody but the Wynns could take the time while moving to edit video. Nobody but the Wynns could take the time while moving to post it on their blog. Nobody but the Nikki could take the time while moving to look like the just walked out of a beauty parlor. But LOTS of guys could take the time while moving to look like Jason. That’s my way of sending you smiles and letting you know that I appreciate you letting us join you for the move. My husband are remodeling a 30′ 1966 Airstream for full time living, thrilled and a bit nervous all at the same time. We’re in the process of liquidating our housewares and furnishings now. Parting with sentimental items has been a struggle. Reading it can be done and there’s life after was exactly what I needed to hear today. We lived six years in Jupiter, Florida on the water, not on a boat but boating was what we did as often as we could. You’re going to love it!!! That would be my husband and I are remodeling…he is taking me with him! What a great new adventure. I must say you have me looking at Sailboats now. Good thing I live close to the water and there seem to be a lot of boats around. To head down to Ft. Lauderdale will you guys take the ICW or go out off the coast? Been there, done that, not full-time but every weekend and vacations on a 30 foot Cabin cruiser. Much more room in an RV, but your catamaran looks very roomy. Good lock, watch our for logs in the water. We just got tired of going from one boat port to another, and the dock fees, well they were something else. Dock fees were more expensive than renting a 3-bedroom apartment. So much more to see in an RV, but then, this is only our third year. I am really looking forward to this!!!!!!!!!!!!!!!!!!!!!!!!!!! Kind of happy/sad. So many good times and great memories, just mine alone in the RV with you both. So many great new adventures to look forward to! You look so comfortable in your new home. I look forward to being part of your new life – even if most of it is on video! It is always fun seeing what you are up to. I am so excited for y’all! This is going to be so much fun, I can’t wait for the videos! Be safe! Congratulations!! First of all, best of luck “Fair winds and following seas” and all that jazz. Now, where did you get those brilliant zippered totes I saw you packing stuff into? Are they as sturdy as they look? And lastly, how are you keeping the cats from jumping to the pier when you’re not looking? Mine are constantly jumping out the door whenever I’m not looking – not to really go anywhere, just to cross the threshold and then stare back inside. Thanks! The zippered totes are linked at the bottom of this post as I figured I would get that question. As for the cats, we keep a super close eye on them when we are at the dock and don’t leave them unattended as they would wander onto other peoples boats. Same at RV parks. Only when we are way out all by ourselves do we let them roam around. So excited for you guys!! Also, unrelated question for Nikki: where do you get most of your clothes? I love your taste and being a Florida I am always on the lookout for adorable tank tops! Thanks! I don’t really have any go to stores but I do pop into places like TJ Maxx and Marshals occasionally. I mostly rummage little shops along our travels. My wife and I are making a big move. We are in the process of moving into our 2011 Airstream Classic ’34. We will be hitting the road full-time at the beginning of June. We will continue to follow your site for the previous RV knowledge and also the future Leopard Catamaran knowledge. We hope that a Leopard Cat is on our future in a few years as well. You guys ROCK!! I just wanted to take the time to say I’ve followed you two before I even became a fulltime rv’er over here in Australia several years ago. You two are part of what inspired this lifestyle for me. You continue to work hard and tirelessly giveing us regular high quality content. And now your are moving into your new home and you are exhausted and busy and you STILL stop and make sure you document it for us! I love you guys! I hope to have a drink with you one day! Thanks for the love Shell! An Australian road trip is sooo on our bucket list. Perhaps our paths will cross when we finally check that one off the list. I love watching your journeys over the years!! They are always very informative! Before you set sail and leave your motorhome I’ve been meaning to ask this, where did you get the seat covers for the captains chairs in your motorhome? I got EXHAUSTED just watching you! Whew, thats a lot of work! I can’t wait for your next video!!! Way to Go! I am looking forward to following your adventures on the CAT with a wee bit of envy (‘cos my darling wife fears a life on the ocean waves & thus it won’t be for us). Your honesty about emotions & abilities is wonderful to hear as it mirrors so nearly all of what I feel about the human experience of the RV / Boating lifestyle. You have given me so many tips and, also, confirmed some of my own thoughts about managing the RV life, for which I thank you. Enjoy your new adventure (like you need me to tell you that). Maybe spending enough virtual time with us over the next few months will convince your wife to give the boating life a shot? I do feel that the worlds/challenges are more similar than a lot of people want to admit to. Both are nomadic forms of travel with the comforts of home and they do come with their own set of challenges for sure. We’re intrigued to see how it all unfolds. Thanks for the love and being a part of the adventure with us. I must say it saddens me to see you leave the RV lifestyle for the mariner’s lifestyle. Having spent 3 decades in the US military and travelled all over the world, I no longer have any desire to be on the water. My wife and I do still love the RV lifestyle and we will continue pursuing that fun. I will miss your great RV trips and videos about the RV lifestyle, but I won’t be watching the yachting videos. I wish you good fortune and safety. Take care and may God bless you in your endeavors. Farewell and remember–red sky at morning, sailor take warning. WOW!! I WOULD SAY ITS A HUGE TRANSITION. HAPPY TO SEE THAT CAT’S COULD CARE LESS AS LONG AS YOU AND JASON ARE THERE IT WOULDNT MATTER WHERE OR WHAT YOU MOVE INTO/ONTO! I WILL BE TRANSITIONING FROM HOUSE TO RV AS SOON AS OUR CHILDHOOD HOME SELLS WHICH IS OFFICIALLY ON THE MARKET ON 5/13 AND TALK STUFF MY PARENTS GATHERED OVER 50 YEARS IN THE SAME HOUSE MY SISTER AND ARE LOSING HAIR OVER WHAT GOES AND WHO IT GOES TO AND WHAT GETS TOSSED, WHAT GOES TO CONSIGNMENT FOR SALE! HOUSE’S IN THIS AREA GET SNAPPED UP QUICKLY.. MY SISTER IS LIVING IN THE HOUSE AND THE HOUSE IM RENTING IS BEING SOLD SO I’M KIND OF IN LIMBO WITH STUFF IN STORAGE AND KNOWING I’LL HAVE TO DOWN SIZE DRAMATICALLY TO MOVE INTO A 36′ BOUNDER OR A 35E AS I LIKE THE LAYOUT IN THAT MODEL. ITS BEEN A DIZZYING COUPLE OF MONTHS AND I’VE GOT AT LEAST 20+ YEAR’S ON YOU AND JASON MY BODY IS HAVING A TOUGH TIME KEEPING UP WITH WHAT MY BRAIN IS ASKING IT TO ACCOMPLISH. GOOD LUCK TO THE 4 OF YOU OUT ON THE WATER I’M GLAD YOU’RE IN A CATAMARAN AND NOT A MONOHULL. MUCH MORE ROOM AND FAR MORE STABLE. I am disappointed to hear that you won’t be towing the smart car, you are going to miss that little work horse. I have followed your adventures for a while now and wish you Bon Voyage. Ah, well, things come and things go … after all, it’s just stuff, even if I am attached to it. And the more stuff I’m willing to let go (of), the freer I become. Amen. That being said, it sure is hard to part with SOME stuff. I wondered about your Smartie, but it only makes sense to sell it. We still have our Smartie (the one with flames, woo-hoo!) and it gets lots of use being pulled behind the RV, which is gonna happen again in about 10 days. I’m so excited for you guys! Not trying to be mushy or anything, but since everything fell in place rather quickly, with the necessary bumps in the road to keep you on your toes. I have to say, all this for you was meant to be. I know you asked for moving suggestions, but we have found no matter how organized you are and how many times you move, each experience is unique. It looks to me like you did a lot of planning and communicating ahead of time and that is at least half the battle. Your new home looks very nice and I love how you have multiple areas to use and store things. Honestly, I never realized Cats had so many options till you guys started this. I’m a cabin cruiser gal and have never learned how to sail. Looking forward to the adventures your share and Godspeed to The Wynn family. Congratulations to the both of you! My wife and I will be in the process of purchasing a RV within the year. Thank you for the videos and information. One question I have, did you have Fleetwood install the solar, toilet and extras? We did but you could go with any of the approved solar installers listed on Go Powers website. Fleetwood service doesn’t exactly specialize in that kind of stuff but are capable. We’re getting ready to buy our home on wheels and I’m putting at least 960W of solar on top. I planned on eventually upgrading to a lithium bank but maybe I’ll just buy yours! How much are you asking? We are not sure yet but will list everything soon…so stay tuned! Wow nothing short of incredible! You two have signed on for the voyage. I don’t know if people who make intimate YouTube video’s need psychotherapy or the people who watch them need psychotherapy but this is fun. You two make it fun and I don’t know you at all but we have RVed within 100 miles of each other in CA. We’re in the procesos of selling our house in Atlanta and are having a new house built in Vero Beach. We close on our Atlanta house July 1st and are heading down to Vero Beach to watch our house being built. We’ll live in our Motorhome while the new house is built. If you guys head back up to Vero Beach, we would love to hook up with you guys! We’re also planning on buying a boat, but something much small to cruise around the Intercoatal. I’m stunned you’re letting the lithium go. I know you said Curiosity already as it, but more is always better, right? I’m a tech-head, so I’m really looking forward to seeing the integration of old into new. Seeing you kit out the new boat is going to be a lot of fun to watch! As I write this, we are in the process of emptying our home of 12 years to move into an RV. Your comments about holding onto mementos is right on. We’re going though that (sometimes brutal) anaysis every single day. I know we need to let things go, but man, is it hard! I think it’s been really helpful to stretch the process out over several months, and to keep our ‘eyes on the prize,’ so to speak, focusing on the long term payoff of these difficult decisions, rather than getting bogged down in the emotions of letting things go. fresh squeezed mimosa’s…. Ha! I just finished the article and I was saving the video until I got home. This is so fun you guys! I want life vests on the kitty’s!! Thanks for taking us along on the adventures! Congratulation! Wishing you continued joy in your adventures and many happy sails. Niki, you don’t have to keep things anymore; you have all those wonderful videos and photos. Do hope they’re backed up. If you have a moment, I’d very much like to know where you get your decals – assuming you’re happy with them. Perfect timing for a moving article. We are currently sorting through al the things in our house… having a garage sale, and getting the 34 foot RV ready to move into. (Including some new flooring.) Out with the carpet! Thanks for the inspiration. And, knowing we are not alone right this instant 🙂 It does feel a little over-whelming tonight. That is so cool! My family owns a boat as well, even though it is not nearly as big or expensive as yours! I look forward to awesome videos coming from you guys later regarding the boat and what not. Oh man, the Wynns are at my supermarket! Grand Horbour can be a little snootie but Vero is a nice community. Congratulations on your purchase and your new journey. While in town try Orchid Island Brewery for some great craft beer only available locally ( made with Indian river citrus, delicious stuff), get fondue and live music at the eclectic kilted Mermaid, and hit grind and grape for some wine and small plates. You two have an incredible talent for creating wonderfully informative videos that are well thought out. Keep up the effort on the water and I sincerely wish y’all a successful and enjoyable life sailing. Congrats on your new lifestyle, we are 2 months away from going full time in our Class A RV. We sold our home and very excited to begin our journey. I learned alot watching your videos and was entertained with your adventures. will you include your tow bar and hook ups with the sale of your car? We live in Naples F. across from Ft.Lauderdale. The former owner’s actions appear to speak volumes about his confidence in the boat and the transaction. He wasn’t hiding or shying away from this experience. This didn’t look like one of the two happiest days of his life. Was he sad when he left? So excited for you and looking forward to enjoying the adventure with you! I understand the overwhelming task of downsizing as we are in the process of going from a 3200 square foot house to purchasing our first RV to live in full time. I have had my first-ever panic attacks as I go through all the stuff that has accumulated over 14 years in this house. Not only is the task itself daunting but mentally letting go of stuff that I have held onto for so long has been some of the most challenging stuff I’ve ever done. I really want this life change…its just really hard getting there. I can totally relate to your post! Just found you guys not too long ago! 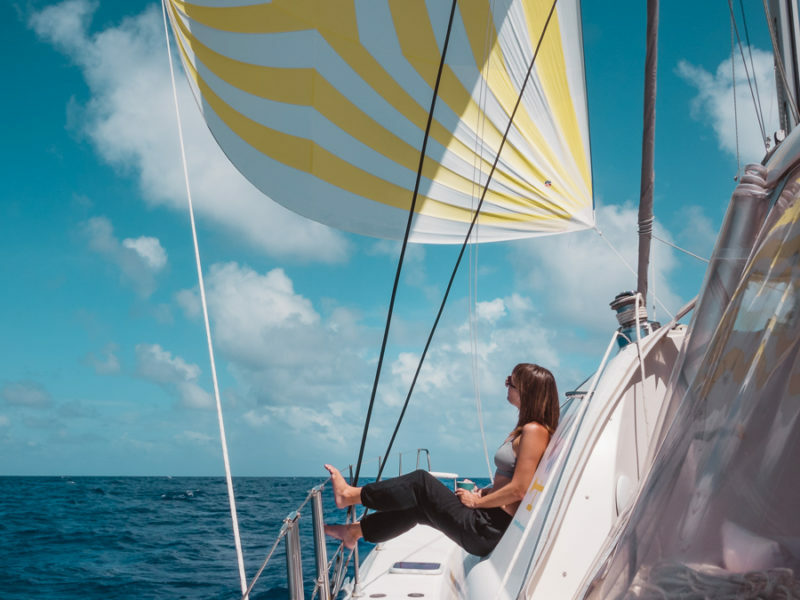 I have been wanting to RV all over the country for a year with my family of four for quite some time now….with the hopes of spending the last portion of our trip sailing the Caribbean. I am looking forward to learning a lot from you on your new adventure. Best of luck. P.S. I am a midwest girl currently living in Boca Raton, FL. I do have my compass headed home soon, though. PS: Cool you make Melita style coffee. Best wishes and I hope the kitties get their sea legs fast. I could never imagine taking any of my cats on an RV, much less a sailboat but yours look pretty well-adjusted and calm. Will they wear little kitty life jackets? What an adventure! I can’t wait to see what boat life holds for you two and all the interesting places you’ll go. Wondering what tips there are for you re traveling with animals? Are cats different than dogs? Your moving is getting exciting. Putting everything in it’s place is always the hardest. Waiting to hear the continuing adventures. Be safe! Re: Lithium Ion batteries, Check the manufacture date on your boat batteries. They do have a set lifespan and start dropping off after a while. If you can transfer them, I would! You know that yours have never sat for months on end, been over or undercharged for too long etc. 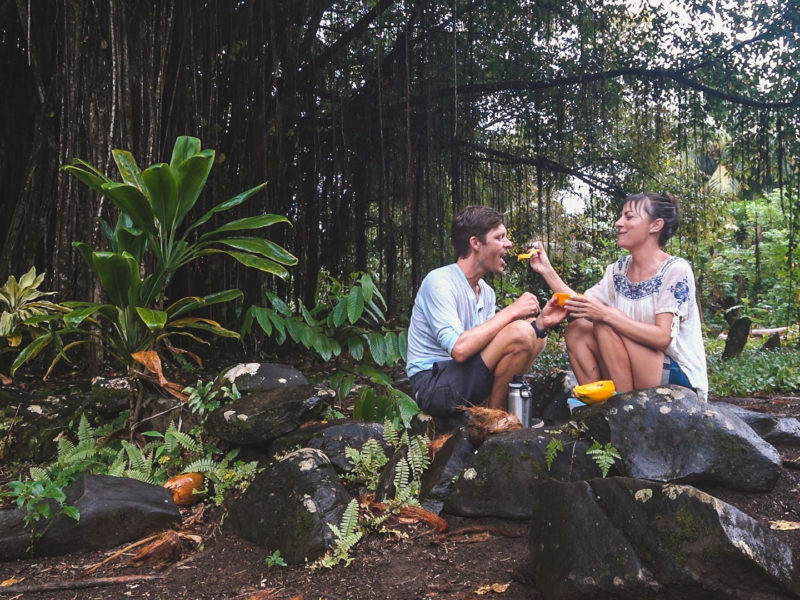 Oh… and extra juice could be a good thing if you decide to do some off-grid anchoring! As yours, my life is being turned on end too. The for sale sign goes up in two weeks. My 2000 sf home will be history. I’m going nuts trying to fit my stuff into a 11′ (88sf) truck camper! I’m doing what you did back in 2010. God help me! The difference is that I’ve got 67 years worth of collected stuff. I know exactly what you were talking about when you mentioned all the stuff that has to be purged. Good luck with your new boat. I’m very happy for you. We’ll all be waiting for your take on your new life on the sea. My two favorite things…..sailing and RV trips. Cool. Right now we rv trip it to different venues and the seven kids sail in regattas. Seven sailing kids…that is a blog name if I have ever seen one! Sounds like such an adventure RVing around to regattas. You’ll get through this just fine!????? ?can’t wait, I wish the very best for you both!! Regarding life jackets for the kitties while underway, you might want to talk to other owners to get the brand their kitties will wear and not be miserable. We have a dog, and outfitted her in http://www.ruffwear.com/K9-float-coat?sc=2&category=694. We had one from West Marine before that, and she hated it. So just know that they are not all created equal. Thanks for the tip Cheryl. I have found a couple of blog posts with recommendations and am thinking we are going to have to order a couple and do some testing to see which one will work out. Congratulations! May you have fair winds and following seas. Congratulations!!!! We are very happy for you two! Exhausting and exciting. Can’t wait to hear your adventures. Congratulations Jason & Nikki, my wife and I have loved following your adventures. We found you when we were researching what to get in an RV. Thank you for all the knowledge you have shared. We currently now own a class A 40′ rear diesel pusher. I am excited to learn along with you all about living on a boat. Jason, you manage to take great video and I have not gotten motion sickness from any of your videos. It is hard to watch others attempt to shoot video. I would experience nausea from just a few seconds of non Jason and Nikki RV videos. Keep being creative and find ways to make money from us watching your well documented adventures. Love you guys and are very excited for you. But please, please put life jackets on your kitties. Congratulations again! Another amazing video documenting the experience while taking us along for the ride. I was almost perspiring watching all of those trips back and forth. Not really since it’s about 50 degrees up here on the Chesapeake. It’s going to be interesting sea…ing (yes I did that on purpose. I couldn’t resist) where you travel. Plenty of time for that. Enjoy your class in the meantime. Awesome blog today. Excited for your new adventure and looking forward to living vicariously! We downsized from a 4 bedroom 3 bath home in the suburbs to a 1/1 study high rise in downtown Houston last summer. Relate to the “junk” comment. We sold all the funiture we owned except a relatively new mattress and weeded out our personal items including clothes and shoes. It was the most freeing thing we’ve ever done! Are you planning to add solar panels to your new boat? I’m sure the ones off the RV would never fit. Possibly the portable kits you had? The ones from the RV will fit! We are having them installed the first week of June…so wish us luck! Absolutely love your blog and been following a long time. I wish you all the luck in the world on your new life on the sea. I will miss your RV work but I am thrilled for your adventure. What happened to the RV? Hello Jason & Nikki, I have been following y’all for some time and watching/reading about the move today was awesome. Congrats on the new home! Thanks for being an inspiration for others and producing rich content for us to learn from and enjoy. Thanks Charlie…we’re really missing the fantastic Tex Mex recently. Have a taco for us would ya! Great job!! Been following you two for a few years and am super impressed with your get out and do it attitudes!! Best of luck with your new adventurer!! Congratulations Guys! Almost there and we’re excited to watch your journey and can’t wait for island hopping videos to show up. Once you’re fully moved in you should do a boat tour video. They are very interesting for us boating folk, and do really well for views on YouTube. Congratulations on wading through the arduous process to own Curiosity! I envy your stamina. Please be sure your provisions include the vegetarian equivalent of MREs for hectic days. I relate to your comment about getting rid of things is easier (we have also moved a lot in our lives), ah, but the shoes! We are planning to move into our RV full time on November 1st & hit the road on New Year’s Eve! My husband just keeps saying, “you need to get rid of some of these shoes”! We are really enjoying watching you transition to your new adventure. My sister & her husband are boaters & we often meet up with them in our RV. Can’t wait till we are full time & they can meet up with is! Good luck! Congratulations Jason & Nikki I am super excited for you both and wish you (4) much success and safe sailing! Aww adore you guys! Thanks for the fun update, inspiring as always. The boat is gorgeous! Singha looks pretty stoked ? Thanks Satya! We are trying to stay grounded while afloat. We’re definitely going to take a day to just be. Nikki and Jason, Thank you for sharing your lifestyle. I am undecided on which to start first the coastal voyage or American Road Trip. Watching your journeys are a wonderful learning experience. I love them! and the way you film is awesome!.. like I am there enjoying it all with you two. Thank you so much. and for your always uplifting, positive attitude towards everything!.. Fantastic Photography! 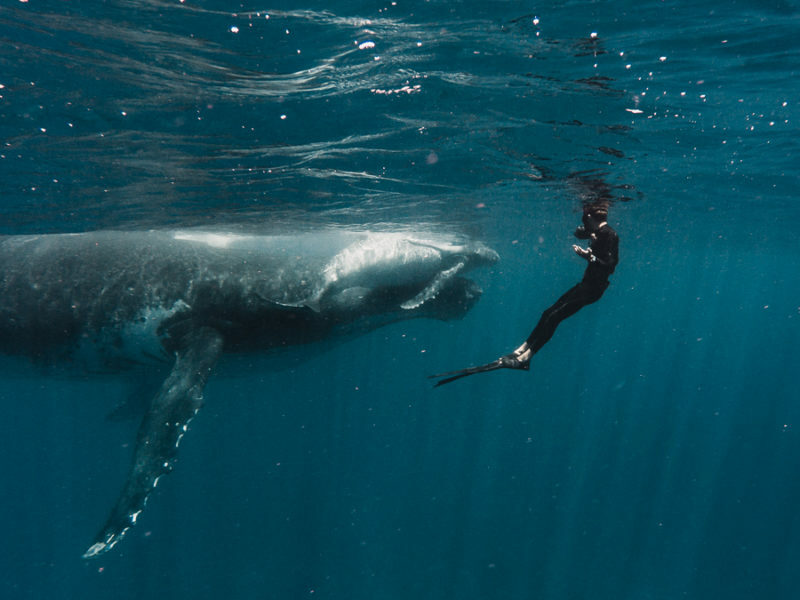 Bravo.. All the best to you two, calm waters, sunny skies, whales, dolphins, mermaids! That is a seriously hard choice! Good luck deciding which direction to go first…either way is going to be an incredible adventure. Thanks for being a part of our journey. Congratulations guys, so happy for you. The boat is gorgeous! The hard work paid off. Godspeed on your travels. Hope to catch up with you one day at an exotic port of call. So happy for you guys! Have been following for awhile and have enjoyed watching and reading your blog. Good luck with the move!